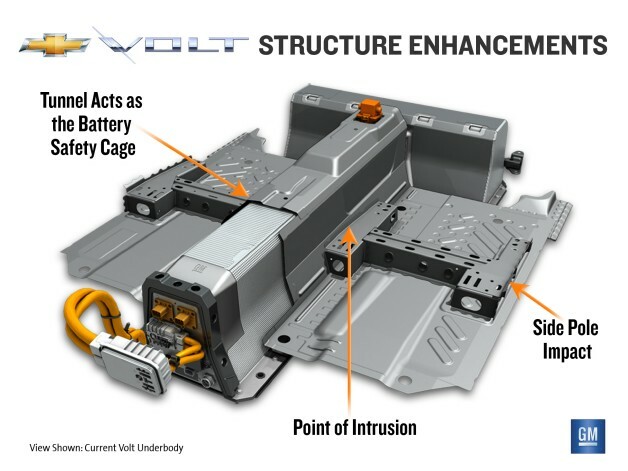 Long story short, GM will be strenthening the Volt’s frame that protects the battery pack from side impact collisions, and make enhancments to the vehicle’s battery cooling system. The enhancements come in response to a National Highway Traffic Safety Administration Preliminary Evaluation which found that a full-scale vehicle crash test last May resulted in an electrical fire three weeks later. GM reiterates that the vehicle is still safe to drive. However, it might not be safe for collision repair shops, where vehicles tend to go after these types of accidents. Also, there is an inherent danger of fire for any type of vehicle collision, so take the battery fire anxiety with a grain of salt. Changes follow NHTSA investigation into post-severe crash battery performance2012-01-05WARREN, Mich. – General Motors today announced enhancements to the vehicle structure and battery coolant system in the Chevrolet Volt that would further protect the battery from the possibility of an electrical fire occurring days or weeks after a severe crash. The enhancements come in response to a National Highway Traffic Safety Administration Preliminary Evaluation to examine post-severe crash battery performance. NHTSA opened its Preliminary Evaluation on Nov. 25 following a severe-impact lab test on a battery pack that resulted in an electrical fire six days later. The test was conducted to reproduce a coolant leak that occurred in a full-scale vehicle crash test last May that resulted in an electrical fire three weeks later. The Volt is a Top Safety Pick by the Insurance Institute for Highway Safety and has earned other safety awards from key third-party organizations. Through the first 11 months of 2011, Volt owners accumulated nearly 20 million miles without an incident similar to the results in the NHTSA tests. “The Volt has always been safe to drive. Now, we will go the extra mile to ensure our customers’ peace of mind in the days and weeks following a severe crash,” said Mary Barra, GM senior vice president of Global Product Development. Strengthen an existing portion of the Volt’s vehicle safety structure to further protect the battery pack in a severe side collision. Add a sensor in the reservoir of the battery coolant system to monitor coolant levels. Add a tamper-resistant bracket to the top of the battery coolant reservoir to help prevent potential coolant overfill. GM conducted four successful crash tests between Dec. 9 and 21 of Volts with the structural enhancement. The enhancement performed as intended. There was no intrusion into the battery pack and no coolant leakage in any of the tests. Volt customers will be individually notified when the modifications are available for their vehicles. The enhancements are being incorporated into the Volt manufacturing process as production resumes this month. Vehicle electrification technologies are important to future of the automotive industry, which is why GM will continue its leadership role in helping the Society of Automotive Engineers develop standards that will help tow truck operators, salvage yards and vehicle recyclers in the proper handling of electric vehicle components. GM will help develop educational materials that can be used by these stakeholders in the future. General Motors Co. (NYSE:GM, TSX: GMM) and its partners produce vehicles in 30 countries, and the company has leadership positions in the world’s largest and fastest-growing automotive markets. GM’s brands include Chevrolet and Cadillac, as well as Baojun, Buick, GMC, Holden, Isuzu, Jiefang, Opel, Vauxhall and Wuling. More information on the company and its subsidiaries, including OnStar, a global leader in vehicle safety, security and information services, can be found at http://www.gm.com. Well done atirlce that. I’ll make sure to use it wisely. I do not know the way I appeared in this article, even so thought that offered was previously fantastic. I would not fully grasp that you can be although unquestionably you will any well-known blogger should you are usually not already. Many thanks!